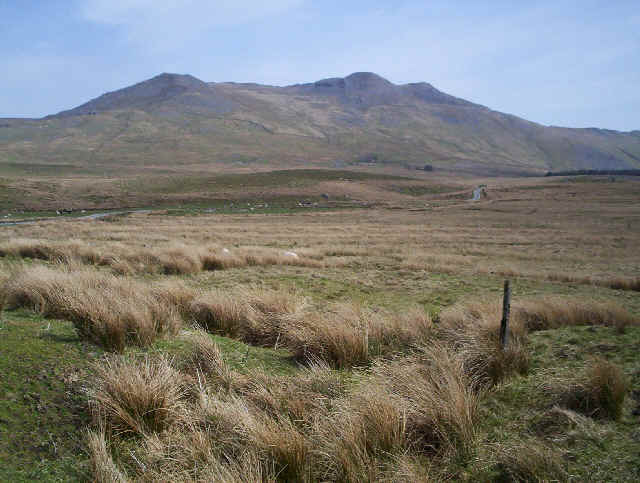 Arenig Fawr is in a remote part of North Wales, although easily accessible from the A4212 Bala to Trawsfynedd road. 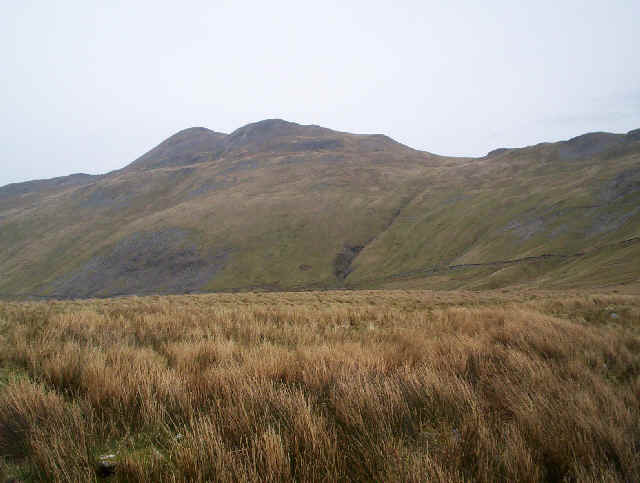 The walk can be started from a small layby off an unclassified road near Pont Rhyd-y-fen, close to the western end of the Llyn Celyn reservoir. 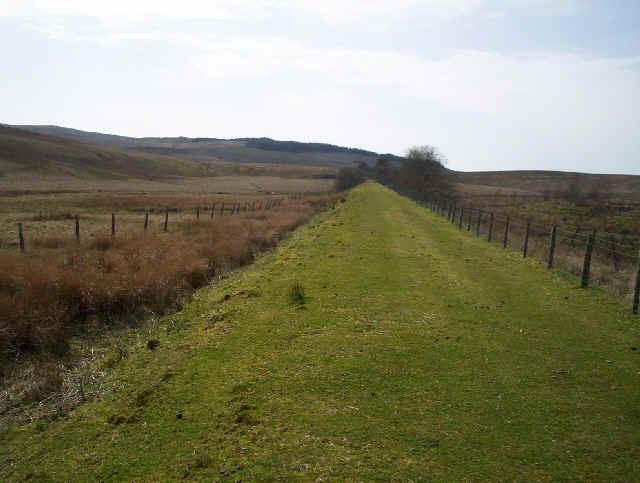 An unpaved lane leaves the road at GR 823393 and initially runs parallel to the track bed of a disused railway line. The lane then heads slightly uphill past an old quarry before reaching the open moorland at a gate. 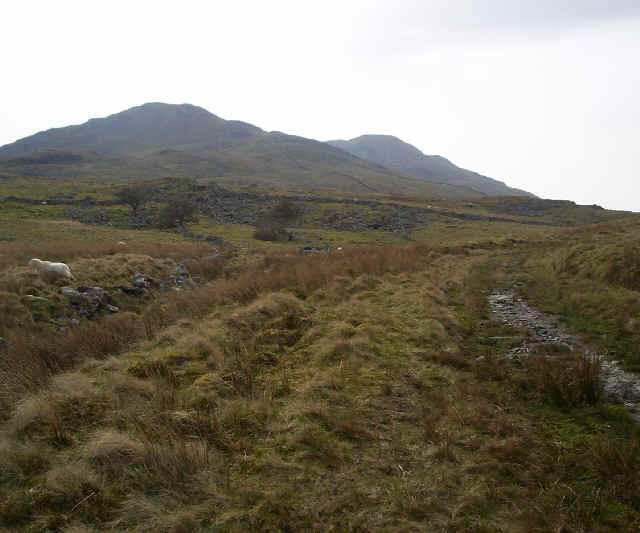 Looking back down the track with Arenig Fawr across the other side of the valley. The bleakness of the surrounding area is obvious in this view looking back down the hill. 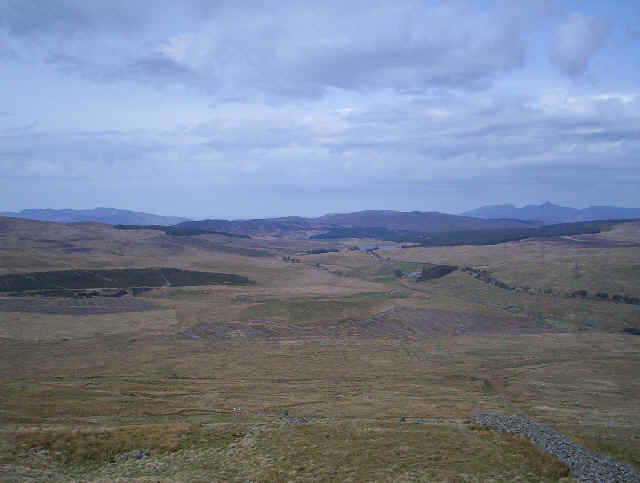 The small lake is Llyn Tryweryn, whilst in the distance can be seen Snowdon. The northern cliffs of Arenif Fawr look formidable from here. 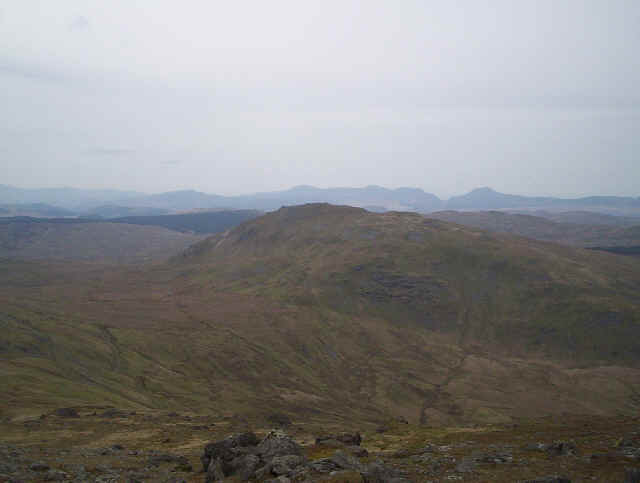 From the summit of Craig y Hyrddod, Arenig Fach can be seen across the valley. 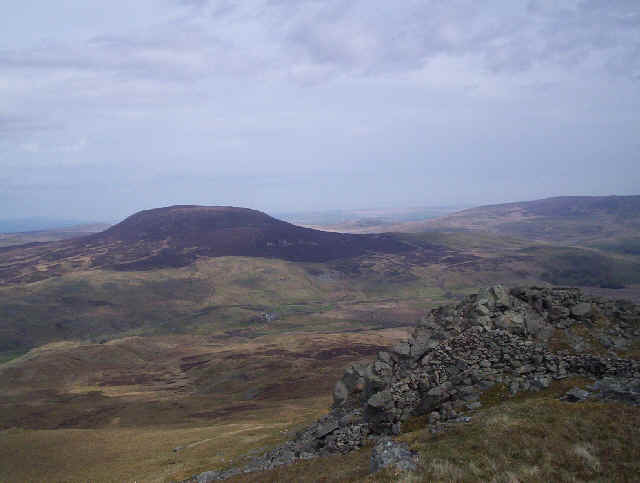 From Craig y Hyrddod it's a pleasant and easy walk to the summit of Arenig Fawr. 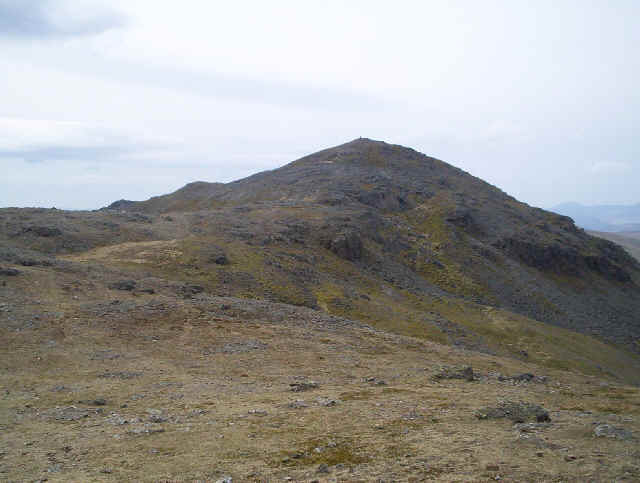 At the summit there is the trig point, wind shelter and memorial to the crew of a World War Two USAF Flying Fortress which crashed on the mountain. 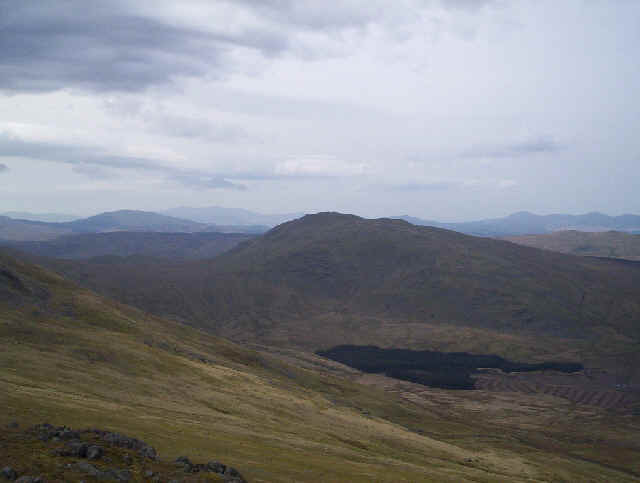 Beyond the second "top" there are a series of small tarns. 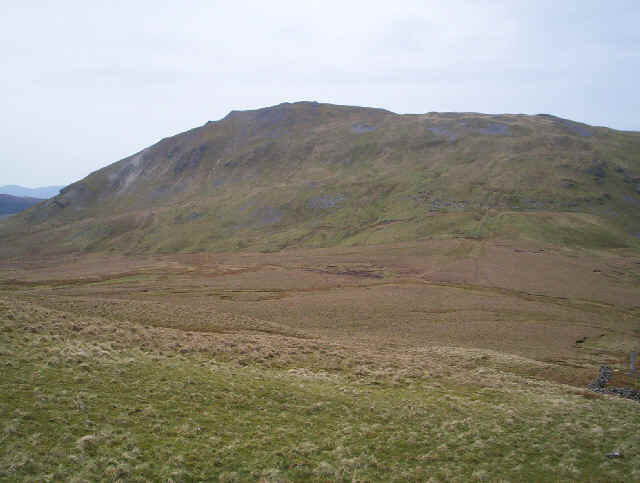 Here we dropped off the hill south-westwards to reach the coll between Arenig Fawr and Moel Llyfnant. 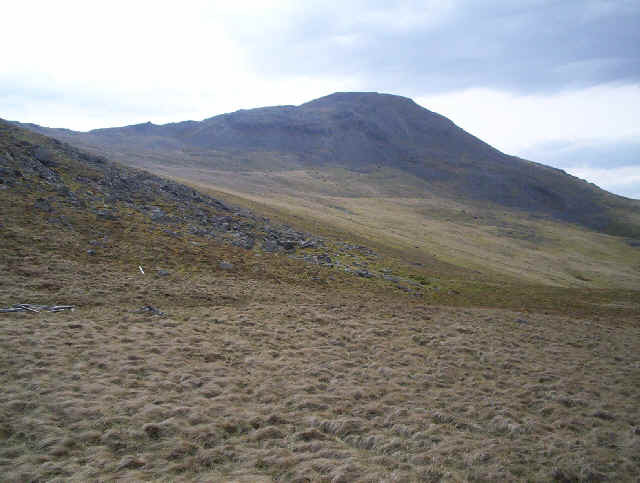 Here we are dropping down from Arenig Fawr to the coll. The hills in the distance are the Rhinogs. The sea south of Harlech can just be seen over the gap in the ridge. 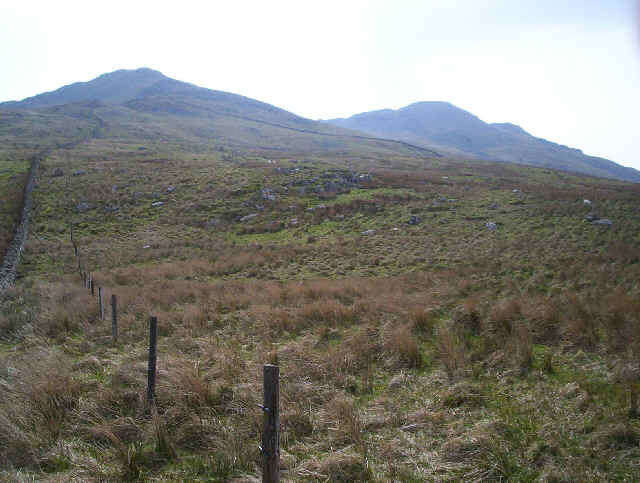 The slightly boggy area at the coll is easily crossed by using the tracks of a shepherd's quad vehicle, before the steep climb up to the ridge of Moel Llyfnant. 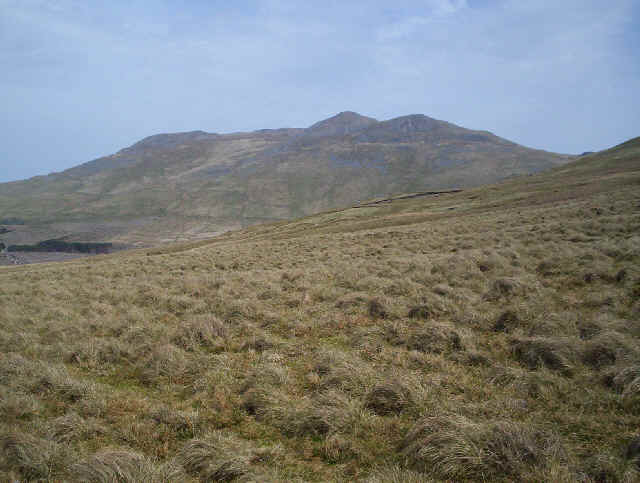 Looking backwards, Arenig Fawr towers above the coll. 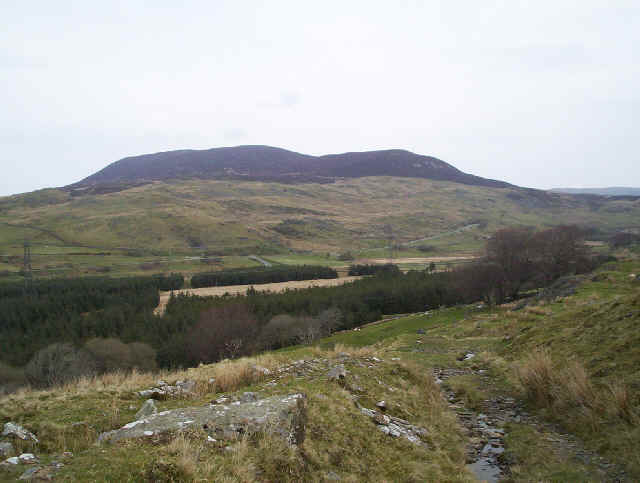 A panorama from Moel Llyfnant. 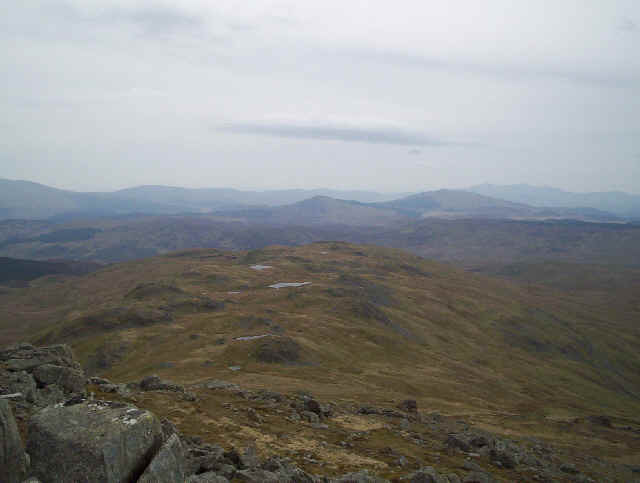 It stretches from the Rhinogs on the left through the Moelwyns to Snowdon, the Glyders and the Carneddau, whilst on the right are the two Arenigs. It's not a perfect image as, the program I used, has obviously repeated some sections. 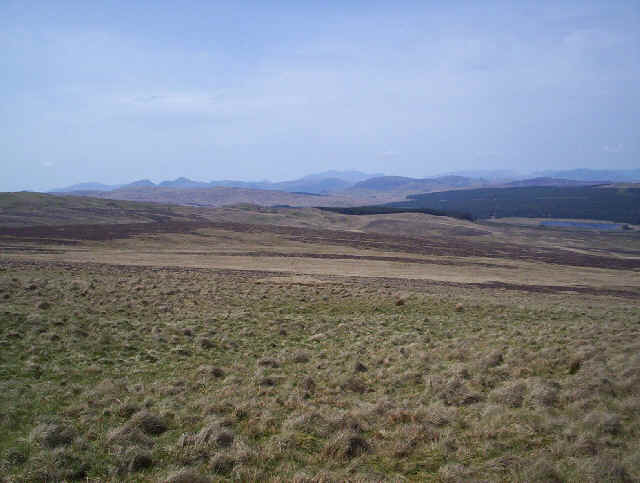 However, it gives a good impression of the views to the north and west. When the link opens click on the image to enlarge. 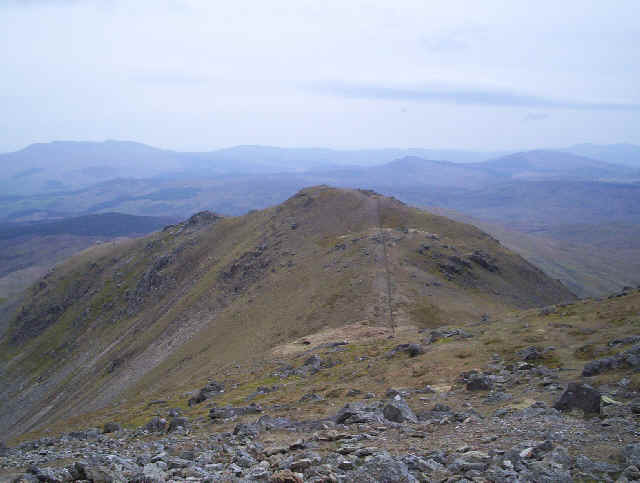 Descending the slopes of Moel Llyfnant with Arenig Fawr in the background. The walk down to the old railway line was somewhat boggy in places. There's a wire fence that runs the entire way from the summit, which is easily crossed where necessary, even by those with short legs! We joined the railway track near the bridge over the Nant y Gist-faen stream. It's then a very pleasant walk along the permissive footpath back to the start. There are now several footbridges where the old railway bridges were removed, so there are no problems crossing rivers. Look out for the old sleeper snow fences along the more exposed sections of the line. A spot height shows the line was at 364m above sea level here so there was plenty of opportunities for snow to fill cuttings.